We the People are not Legal Eagles, but we identify some very good clauses in this spectrum of changes to the Constitution of Sri Lanka. 1. Make NATIONALITY the KEY label attributable to everyone who is born, gets married, dies or applies for a position the the Public or Mercantile sector in SRI LANKA. 2. Make RACE and RELIGION matters of peoples’ private domain and to expunge these labels from documents such as BIRTH CERTIFICATES, WEDDING CERTIFICATES, DEATH CERTIFICATES. 3. Make the teaching of ENGLISH in schools and universities MANDATORY and give effect to this in practice by actively recruiting teachers from amongst SRI LANKANS or even from abroad, to reach as a goal, fluency in this VITAL Link language at the Grade 10 GCE examination. 4. Ideally also, ALL kids should be taught TAMIL and SINHALA in schools up to Grade 10, irrespective of their ethnic background or label or race. 5. Make it ILLEGAL to have loudspeakers in the precincts of MOSQUES, CHURCHES and TEMPLES and in any event make it a PUBLIC NUISANCE to have sounds of PRAYERS, PIRITH or ANY OTHER CHANTING or SERMONS pervade beyond the said precincts. Thereby allow people in the vicinity of these places of worship relief from having to endure these loud sounds, however well-intentioned they may be. Those who wish to listen and participate should be requested to visit the said places of worship. So say We the People. My sentiments exactly. Nationality should be Sri Lankan only (it should be illegal for any public or private organisation to seek one’s race). Like you said religion must be again a very personal and private affair and allowed to practice only in the place worship like a church, temple, kovil or mosque or in one’s own home without disturbance to others living in the vicinity. I would also add that monks’ activities must be restricted to temple activities and should not be allowed to engage in political, business or thuggery. Their sole purpose must be to teach and promote Buddha sasana within the temples and not disseminate hate among the multi religious community. I would add that like in the catholic church, there must be an established administrative strata controlling all monks and temples where each monk’s actions can be monitored, good or bad and remedial measures can be taken by the higher authority. Monks protesting on roof tops or giving hate speeches in public has done irreparable damage to the buddha sasana and one cannot bow down in front of these monks even if they are wearing the saffron robe. Also take off the clause giving prominence to Buddhism in the Constitution. If it is private domain, religious rites in political activities must cease. Should you rush to get the blessings of the Mahanayakes, should you invite religious dignitaries of all religions to state functions. I can go on with this list. In the birth certificate please delete the clause as to whether the parents were married. This has brought about disaster to many children attending schools. Is it allowable for the Catholic church to use the resources of a foreign state (the Vatican) to plant churches in every village? Why do you allow the Hindian government to sponsor rebuilding, renovation, expand Thiruketheesvaram temple at a colossal cost? If Vatican funding churches and converting people into Catholicism is increasing your religious rage, one question you should always ask yourself is why other religions failed to retain those converts within their own religion. If conversion or building new churches were wrong then the state should have brought laws to prevent them. I would rather oppose it on the ground that it will prevent us from converting Sinhala/Buddhist into Buddhism. Such law will make our life difficult. Where is your comment? Amarasiri did not see any. We the people – Excellent contribution for betterment of our people. peace in the country and then the progress comes with it. to see that there is unity in the country, finally. We the People, this is brilliant and I hope they’d listen. To your list I would also add that the Army, Navy, Air Force, Civil and Diplomatic Service recruit members to reflect the members of the community at large as to its component of race, religion and creed etc. I will also add to make discrimination based on gender, sexual orientation, race, religion, class and creed etc. in employment, schools and elsewhere, a criminal offence punishable according to the severity of the offence as adjudged by the Courts. Finally, the Separation of Powers between the Judiciary, the Executive and the Legislative is recognised as paramount and maintained. Make it a criminal offence to DRIVE LIKE MORONS on the roads with NO RESPECT for HUMAN’s or ANIMAL’s. Lets hope the Government “Of the people, elected By the People, For the People” take these fantastic suggestions and consider implementing it! This is a waste of time . Isn’t it?. And act only on their advice..
Is Assath Sally minister too …. Now, now Sumane, it’s OK, everything will be OK (pat, pat, pat)…. now get some rest and go to sleep putha. And know ye that it applies to you, my good man. Is good that change of Republic Constitutional ,not that by overnight. But present Constitutional Principles violated by Newly elected President of Mathripala Sirisena. He( MS) act on against unconstutioniol way and Illegally methods to misused his mandate. Public has lost trust and confidence of by his unauthorized move. Having suspension of MS is now working towards that authorization regime that undermined democratic for interest of few handful class behind him. How can we engaged for New Change of Republic Constitution under this situation, that MS oriented backward leadership. For New Democracies? Is that good governances or rule of Sovereignty for the People? Minister. First time in political history Sri lanka 1948! has no power entrusted by constitution clause remove the CJ. Said power constitutional been give to Members of Parliament. Sri Lankan is not that Egypt, Libya, Iraq, Syria or Yemen. We are maturate democracy in developing and emerging world, ours democratic had been tested Numerous occasion last 67 years. MS is not belongs to political elites class. Even his team of Elites having no pool of wisdom. He has to learn democracy by himself not from other wrong advices. This were deficit of democracy arise when man is not fit for job! Adhikari, You are murdering the Queen, pls go for some English tuition; no one can understand what you have written. Kick Ranil out of office, the constitution provides for it. All that has to be done is bring a no confidence motion in the parliament. In 2001 Ranil had only 109 seats and yet had the parliament’s confidence to continue as prime minister until 2004. For us 109 MPs out of 225 was a minority government. You should brush up your political history if you want to say the right thing which hopefully benefit us all. He or she, his or her!! Can a transsexual become a president?? Piss off Pala – your time is done. All these are temporary amendments to hoodwink the international Community and the gullible Tamils and save Sri Lanka and the war criminals from independent, international, investigations into war crimes against Sri Lanka. The moment the utility for this amendment is over, it will be annulled by a majority vote in parliament, and we are all back to square one. The transitional provision (Section 57) in the 19th Amendment to the Constitution declares that every person holding Public Office on the day preceding the date on which this Act becomes law, as the Chief Justice, Judges of the Supreme Court, the President of the Court of Appeal, Judges of the Court of Appeal; shall continue to hold such office. And it also provides that every person holding office on the day preceding the date on which this Act becomes law, as the Chairman or a member of the:- (a) Parliamentary Council; (b) Public Service Commission; (c) National Police Commission; (d) Human Rights Commission; (e) Commission to Investigate Allegations of Bribery or Corruption; or (f) Finance Commission, shall cease to hold such office with effect from the date on which this Act becomes law. In my view this is a clear violation of the sovereignty of the Country vested in the people of Sri Lanka (Article 3 of the Constitution) and clear betrayal of trust and confidence placed in Sirisena Administration by the people. Every person know the despicable manner the former President Rajapakse abused office of the President to appoint men loyal to him men to the Supreme Court and the Court of Appeal with no recommendation whatsoever from the Constitutional Council established by the 17th Amendment. 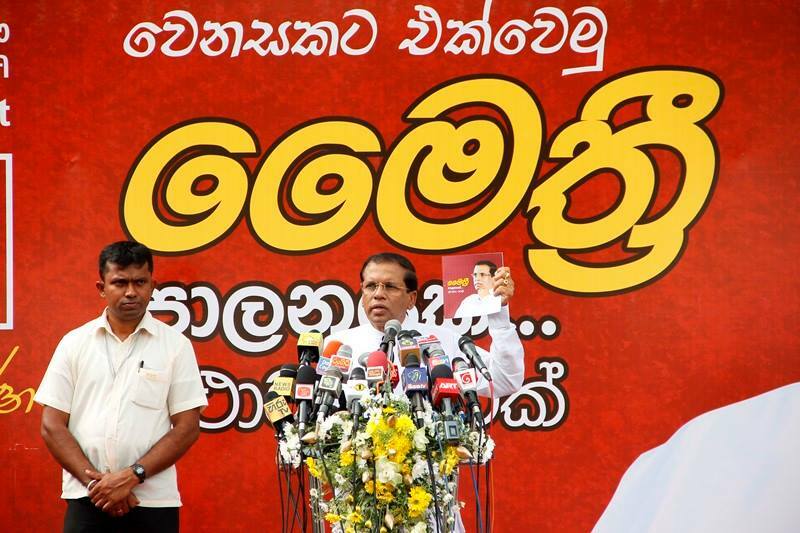 Therefore, the new regime is under duty to rectify this monumental blunder caused by President Rajapakse. Yet, as it stands the provision of the Section 57 is such that it ask people whose Judicial power was blatantly violated by the man called Mohan Peiris with those appointed to the Court system by Rajapakse, to accept them with no question ask. This is completely unacceptable. The People deserve a Vibrant and Independent judiciary to exercise their Judicial power not a one filled with subservient and subdued members appointed to the Court of Appeal and Supreme Court by the former President Rajapakse on the recommendation of Mohan Peiris who shall bound to go with the proposed amendment is duly enacted. And if the new administration failed to encounter this challenge, as Mohan Peiris pleaded with PM Ranil Wickramasinge (to remain in office of the CJ) with an undertaking given to give any judgement to please the government, in my view the peoples’ Trust and Confidence in the Judiciary would remains a huge concern. Mr Sumanasakera I suggest that article 5(1) should further state that no person who has been twice elected by the people to be President should be precluded from being a candidate at any national election.This would be the final nail to prevent MR from returning to Parliament and dash all hopes of people like you,DJ and the losers who are attempting a national revival on the same lines as Hitlers Germany. So the constitution is going back to Westminster style. Its bicameral in nature although the “COUNCIL OF STATE” does not have powers to veto bills. The Council of State exists purely on an advisory capacity. Perhaps it needs a little bit more teeth. It can oversee workings of various commissions such as audit, bribery and public services commission. This will give the PM more time to focus on workings of the Parliament and the cabinet of minsters. SLFP says the President belongs with them. UNP says they supported him to power. This dilemma has arisen purely because the head of state is not a-political. The President as the head of state must be impartial and apolitical. In the future whoever becomes the president he/she must totally divest himself of any connection to a political party. Richard… why don’t you Start English lessons for others, I will join with my Queen? Now days Queen also very weak in English ? Despite all the promises the role of president has only been amended around the edges. The president still remains above the law (well spotted aratai). The president still appoints most senior public officials (provincial governor, IGP, attorney-general) whilst the others are appointed “on advice” from MPs. This means that if the president’s party also controls Parliament he in effect has absolute power. This is what MR, JRJ and Mrs B did. Given the rampant cronyism and nepotism in the country this new amendement still leaves the door open for another constitutional dictator like MR. What a waste of time. Prof Sundaralingam taught her maths. Now you too can teach her something, English. Prof.Sundaralingam was not only that taught Maths , his teaching was belongs school of Separatism how to divided Sri Lanka? That is how New Queen ( House of Hanover)learn lessons and research on work and seek split our nation into Two Races. Yours memory still short live. HE Queen weak mean that only English, which Her Majesty Empire has lost Globe power. Aiyo Adikari, why are you murdering the poor old lady? Take an intensive course in the English Language. I also think that religion should be taken off the school curriculum as religion should be a private affair. It divides the students and marks them with their religious identity from a very early stage in their school life. Parents should take the lead role in inculcating their religious doctrine with their own children. Comparative religious studies should be taught instead and each festival should be celebrated in schools with all the children participating irregardless of which religious denomination they belong to. Ethnic harmony and nationalism can only be achieved if one removes the demarcations in the public space & Singapore is one country that has achieved it through these methods. Do you all know who would oppose this. The teachers of religion in school and those who aspire to be such teachers. We need to address their issues if we need to stop this. I am an atheist, but I don’t think religion is all bad. The times we live in, religion is embraced by most people and it is a useful crutch in most situations. Schools should teach all religions and stick to any particular one. Yes, I agree that freedom of worship should be protected under the constitution but that after nearly 70 years of independence there is any need to grant additional constitutional precedence to Buddhism as a state religion. The constitution in most modern and liberal societies gives pride of place to a secular society bearing in mind that the dominance of any state protected religion be it Christian, Islam or Buddhism has led in history to religious fanaticism and a fracture in religious harmony. This brings me to the next point that needs constitutional safeguard and which has held back the development and progress of civilised society in Sri Lanka. A guarantee of the rights of minorities in the country. We can see that the constitution creates a body called the Official Languages Commission in recognition of the right of a minority in the country to the official use and furtherance of its language. I’d also like to see the protection of the rights of the minorities in the country by the creation of a body called the Minorities Rights Commission in the constitution. One way of doing this is to create a new body in a new Section 41(B)i just below the Section 41(B)h for the Official Languages Commission. I envision this body to comprise the Chief Justice and/or any judge of the Supreme Court or the Court of Appeal appointed by the Chief Justice, the Attorney General, 2 Cabinet Ministers from he minorities and 2 MPs from the north and the east. This is just my suggestion and I would leave it to the country’s legal eagles to flesh out this provision to safeguard minorities rights under the constitution.